‘Laal maas lamb’ is a chilli-packed Rajasthani curry that’s cooked low and slow to get the lamb really tender. 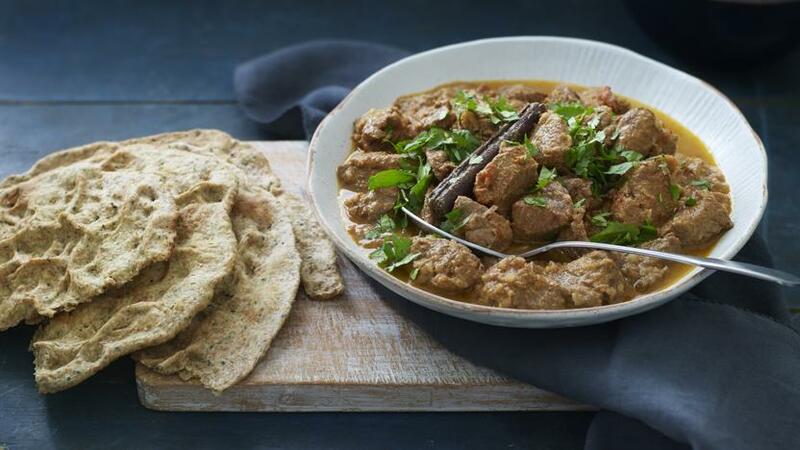 Serve with khooba roti, a Rajasthani flatbread. To make the curry, put the chillies in a heatproof bowl and add enough just-boiled water to cover. Leave to stand for 30 minutes, then drain in a sieve and blend into a paste. Preheat the oven to 180C/Fan 160C/Gas 4. Heat the ghee and oil together in a flame-proof casserole over a low heat. Add the whole spices and fry for a few seconds, until fragrant. Add the onions, ginger and garlic and fry for 10 minutes, or until softened and browned. Add the chilli paste and cook for 2 minutes. Add the lamb and cook until lightly browned. Stir in the ground coriander, cumin, salt, chopped tomatoes, sugar and yoghurt and cook for 3–4 minutes. Add 250ml/9fl oz of water and bring to a simmer. Cover with a lid and bake in the oven for 1½ hours, or until the lamb is very tender. For the khoobi roti, melt the ghee in a small saucepan over a low heat. Set aside. In a large bowl, mix the flour, seeds and salt. Stir in the fenugreek leaves. Add 1 tablespoon of the melted ghee and rub into the flour. Add enough water to make a firm but pliable dough; the amount you need will depend on the type of flour you are using. Knead the dough on the work surface for 2–3 minutes, then put into a clean bowl and cover with cling film and leave to stand for 10 minutes. Divide the dough into two portions and form into balls. Dust the surface with a little flour and use a rolling pin to roll one portion into an 18cm/7in round flatbread. Use your finger and thumb to pinch the dough all over, creating peaks and valleys in the dough. Oil a large frying pan or griddle pan with 2 teaspoons of the melted ghee. Add the roti, flat-side down, and cook over a medium heat for 5 minutes, or until browned on one side. Transfer to a baking tray peak-side up and repeat with the second ball of dough. Preheat the grill to hot. Drizzle the rotis with the remaining ghee and place under the hot grill for 2–4 minutes, or until well browned. If neccessary, spoon excess fat off the curry. Season the with salt, garnish with fresh coriander and serve.